A wide, spreading shrub with dark green needles. The branch tips are pendulous. Does well with some shade and needs a well-drained soil. It is drought tolerant once established. 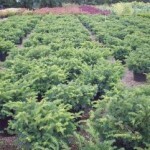 It makes an excellent medium sized groundcover, especially in woodland conditions.